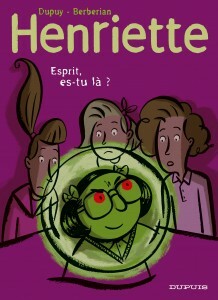 Henriette is a small podgy adolescent who also happens to be shortsighted. Not always easy to get by at this delicate age. But thanks to a sturdy temperament, she faces up to the difficulties of life, even when mischievous minds come to upset her daily life and that of her classmates. With ‘Henriette’, Dupuy and Berberian continue their bittersweet chronicle of adolescence with humour and tenderness, quietly taking their place among the great creators of French comic strips.